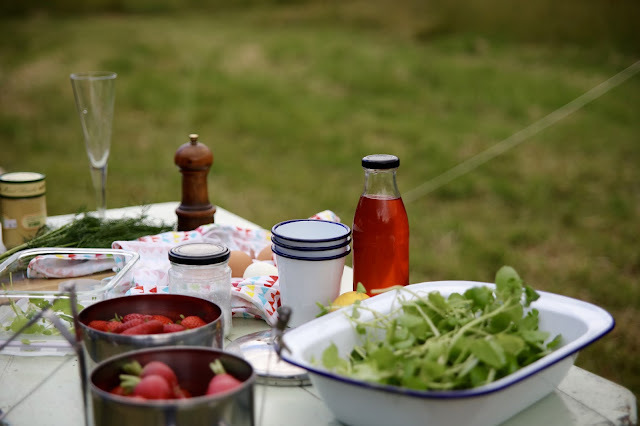 A drizzly grey evening was not what I had in mind when planning a midsummer picnic. In my mind, we were going to be sitting on picnic blankets, basking in the warm sunlight and watching the sun set over golden meadows, dotted with great bales of freshly cut hay. 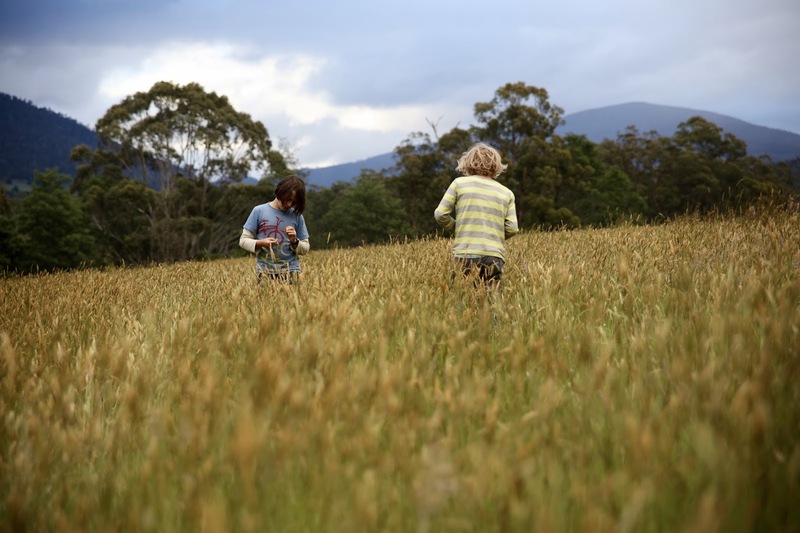 Instead, we rugged up with coats and scarves, wellies and beanies, and headed to the field anyway, determined to enjoy the longest day whatever weather this crazy Tasmanian summer threw our way. There's something magical about midsummer, the solstice, a day for being outside and marking the turning point when the days start to get ever so shorter again (already?!). A day worth marking in my books. 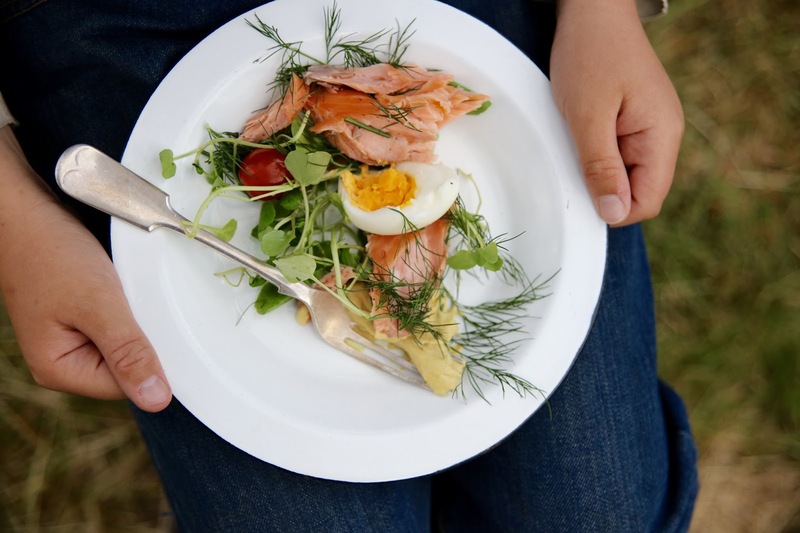 We sat in the drizzle, hoping it would pass, and supped on a summertime feast of hot-smoked salmon, watercress and dill, soft boiled eggs and loads of radishes. For sweets there were the most fragrant of strawberries, chocolate coins and a bottle of prosecco to mark the occasion. The children weren't bothered at all by the weather, and, looking like they'd just stepped out of a Boden catalogue, ran through the meadows playing hide and seek in the long grass, and rode their bikes speedily down the long steep hills. We made our way home in the gloaming, and honestly walked through the door as it just got dark at 10pm. Of course, today is the perfect weather for a midsummer picnic, so we'll probably head out and do it all again. As they say, you've got to make hay while the sunshines. HOW GOOD IS THE WORD GLOAMING! Oh to rug up in December sounds like a dream! Enjoying the longer days and eating outside under the trees is such a beautiful way to celebrate the season. I just wish the wind would back off!! I'm late to the party but...may I ask where you found your enamel cups? Adore!